Sept. 12, 2017 | 8:35 a.m.
A flood in June 2008 in the Wisconsin Dells area destroyed several homes, washed out a county road, and caused Lake Delton to drain into the Wisconsin River. Climate change is projected to make the upper Midwest a wetter place as more frequent and intense rains hit the region. The summer of 2017 may have been a taste of what's in store for upcoming decades, as regular, heavy storms brought flooding to communities around Wisconsin. Across the continental United States, flooding has increased since the mid 20th century, creating costly damage while challenging local infrastructure and making it harder to plan for disasters. Weather data and climate and research indicate that more intense and unpredictable storms will mean even more flooding around Wisconsin in the years ahead. At the same time, some areas of the state are experiencing rapid development of new buildings, road and parking lots, all of which impede natural and engineered water drainage systems during intense rainfall events. Major floods may be mere abstractions to people until they actually happen. Given such difficulties in perception, researchers at the University of Wisconsin-Madison looked for a way to bridge the gap between already familiar storms and an uncertain future. A team led by UW-Extension stormwater specialist David S. Liebl and UW-Madison professor of civil and environmental engineering professor Kenneth Potter, now both retired, decided to approach this problem through computer modeling. Liebl and Potter's solution: Look at a storm that already happened in one place in Wisconsin, and show what the damage would be like if it had hit another place. (Disclosure: This reporter previously wrote about their research for UW-Madison College of Engineering communications, prior to joining WisContext.) They called this approach "extreme storm transposition." "It's getting people to understand, hey, that was just chance, and hey, there's a good chance that that could happen here," Potter said. In the research group's computer model, "that" was the June 2008 storm across the Midwest that caused extensive flooding in the Wisconsin Dells and Baraboo River area, and "here" was central Madison. 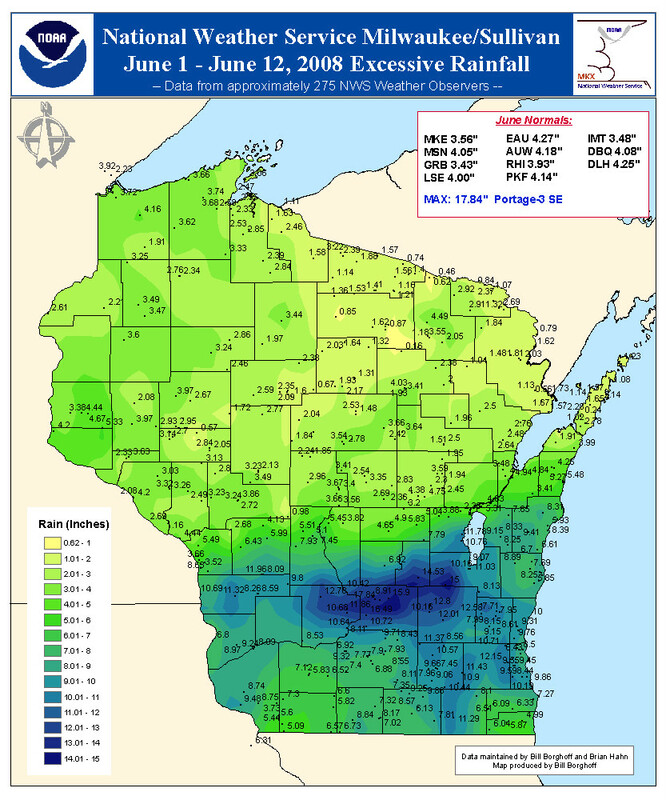 A GIS plot of observer rainfall totals for June 1-12, 2008 shows extreme precipitation levels in south-central Wisconsin. The storm drenched a wide swath of southern Wisconsin — in the heaviest hit area, flooding destroyed homes, threw a wrench in the Dells' tourism industry during its busy season, and washed out a section of a county highway, which in turn caused Lake Delton to breach and empty into the Wisconsin River. In their model, the researchers accounted for cumulative rainfall totals over a period preceding and including major storms on June 7 and 8. Transposed over Madison, the model tested what would have happened had this extreme rain event struck the upper Yahara Watershed, which drains into Madison's lakes. These conditions would have also raised the levels of Lake Mendota and Lake Monona, which sit to the northwest and southeast of the mostly low-lying isthmus on which the central city is built. Local officials have some control over the level of water on Lake Mendota, thanks to a lock between it and the Yahara River. Lake Monona has no such controls, though, and drains slowly under even normal conditions. The transposition computer model couldn't account for every nuance of Madison's storm sewers, but the amount of water that fell in the 2008 storm would have overwhelmed them. Large portions of the central city, including areas just a few blocks away from the Wisconsin State Capitol, would be underwater. If Madison experienced the same kind of storm as Baraboo did in 2008, central neighborhoods and other areas of Madison would flood. 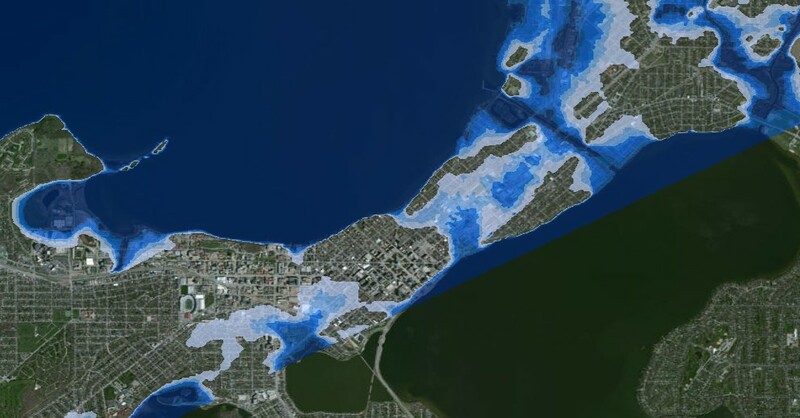 "Estimates of the duration of this simulated flooding range from days to weeks, depending on how quickly downstream flood flows would be able to move," Liebl wrote in a 2016 report for WisContext. "Damage would be catastrophic." In 2014, Liebl and Potter started sharing the results of their study. Their outreach included discussions with city of Madison and Dane County officials about how they could use the information to protect the area from the worst impacts of a catastrophic storm. What this issue comes down to, Potter said, is not just what happens with storm sewers, but the choices communities make when paving new streets and constructing new buildings. When rain falls on a porous surface like soil, some of the water will seep into the ground, some will evaporate, and some will flow on the surface into nearby streams, lakes, and rivers. When rain falls on a hard, impervious material like an asphalt road or a rooftop, the water becomes what's known as runoff, traveling into storm sewers and surface water because it doesn't have the opportunity to soak into the ground. Streamflow in the Yahara River is increasing at a faster rate than precipitation levels upstream in Madison. The more land a city develops — replacing soft earth with pavement and roofs — the more runoff it creates. People can mitigate runoff by installing green roofs, rain gardens, or permeable paving, but development has an inevitable long-term effect on stormwater runoff regardless. 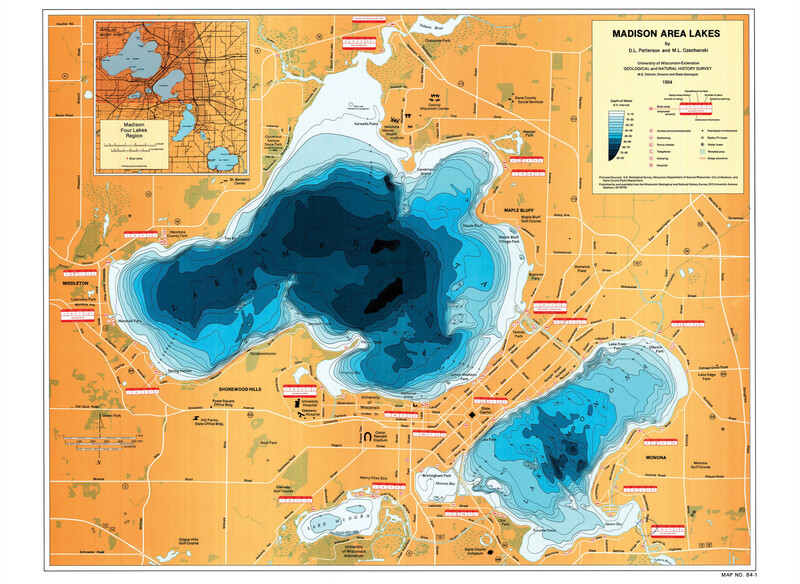 Over the past century, the Madison area has seen more and more urban development, and the maximum level of Lake Mendota has gradually increased. 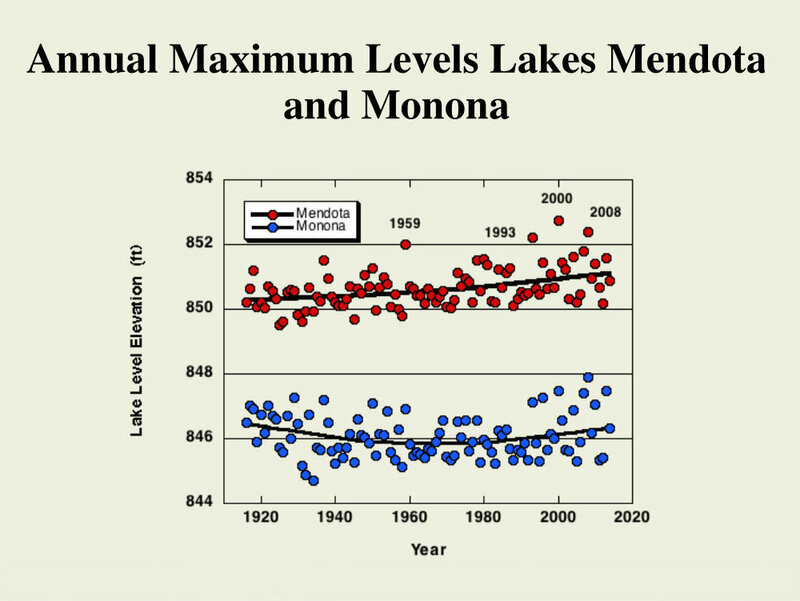 The average annual water level for Lake Mendota has risen by about a foot over the past century. As anyone living in and around Madison can attest, the past few decades alone have seen explosive development for the metro area. 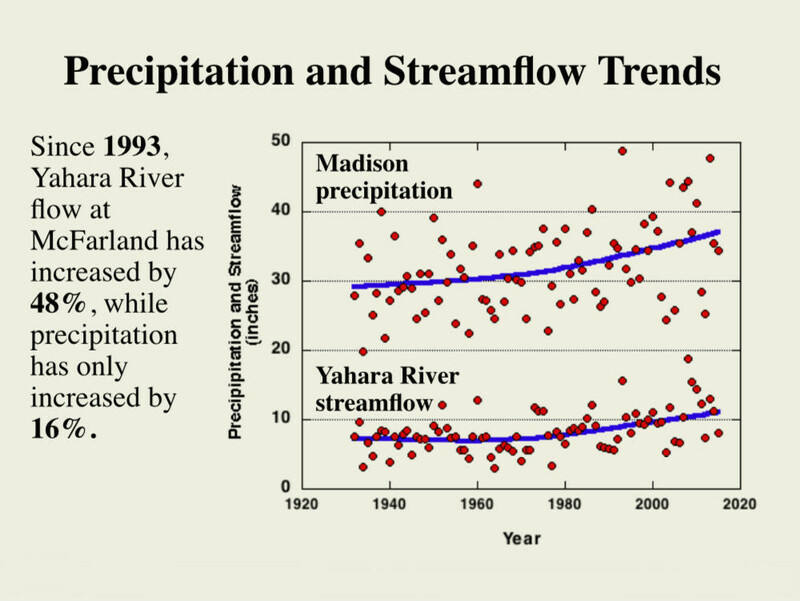 Between 1993 and 2014, Potter found the streamflow of the Yahara River at McFarland (southeast of Madison) increased by 48 percent, while precipitation increased by 16 percent. What this means is that urban development is keeping more rain from recharging the groundwater in the area, while placing more demands on the watershed's storm sewers and natural surface-water systems. Of course, some of the most developed areas are right on Madison's isthmus, which is not only densely covered with pavement and roofs, but much of which has a low-lying topography that city of Madison assistant city engineer Greg Fries likens to a bathtub. When rain falls into these areas, the only way out is through a sewer pipe. Most of these pipes are old, and can only carry off so much water at a time. The oldest area of Madison is located on an isthmus between two lakes. "In the downtown area we are largely living with a system that was designed in some cases almost 100 years ago or more actually," Fries said. "For newer development, as the city continues to grow and we do continue to grow, we have an opportunity … to maybe think about how the system operates differently and how it is going to fail as we design it." Currently, Madison designs newly constructed storm sewers to handle a 100-year flood, but it's extremely difficult and expensive to replace the city's extensive pre-existing infrastructure. Even with the insights gained from the storm simulation, Fries feels there is only so much the city can realistically do. "We have a physical limitation of Lake Monona as a starting condition," he said. "If that lake is high, there's not much I can do other than lower the lake or raise the isthmus." The city of Madison has made some changes when developers want to build new structures in potentially flood-prone areas, requiring buildings to be set up on higher foundations and therefore harder to flood. "We basically accept the fact that the road is going to flood, and we don't let new developments design themselves into a problem," Fries said. Even if Madison — or any other city – built the best storm sewers money could possibly buy, it wouldn't be able to stop worrying about floods. "There will always be an event that outpaces your design," Fries said. "It's inevitable." It's not just the complexity of climate change (and the politics of climate denial) that makes it difficult to inform and convince people about the dangers of future floods. Wisconsin has a long history of floods, but their location varies widely from year to year, often striking one or a few regions of the state while sparing others. This unpredictability, Potter believes, makes being able to visualize a potentially catastrophic storm more helpful. "To talk about what happens in one particular year … it's not the big picture," Potter said. While Potter and Liebl's research project essentially wrapped up with some recommendations for improving Dane County's stormwater practices, its approach to gauging the power of extreme rainstorms will likely prove increasingly relevant. "After the catastrophic flooding in Texas and the likely catastrophic consequences of [Hurricane] Irma, I expect that storm transposition will be used around the country to assess vulnerability, improve stormwater and flood management, and to plan for future floods," Potter said.